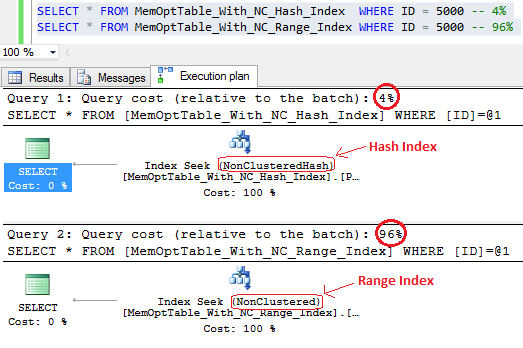 In SQL Server 2014 for In-Memory tables there are lot of changes in DDLs compared with normal Disk Based Tables. In-Memory Tables related changes we’ve seen in previous posts, check [here]. Here we will see Memory Optimized Index related changes and few important things to take care before designing your Tables and Indexes. 1. Indexes on In-Memory tables must be created inline with CREATE TABLE DDL script only. 2. These Indexes are not persisted on Disk and reside only in memory, thus they are not logged. As these Indexes are not persistent so they are re-created whenever SQL Server is restarted. Thus In-Memory tables DO NOT support Clustered Indexes. 3. Only two types of Indexes can be created on In-Memory tables, i.e. 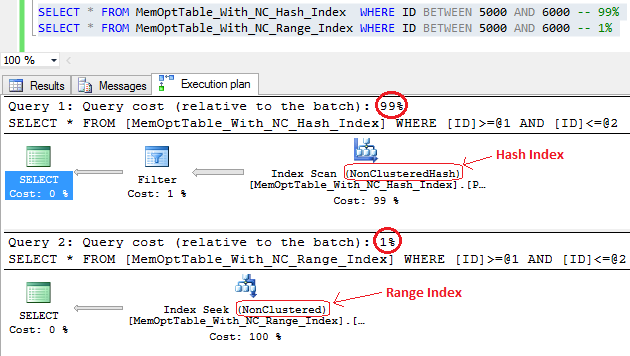 Non Clustered Hash Index and Non Clustered Index (aka Range Index). So there is no bookmark lookup. 4. These Non Clustered Indexes are inherently Covering, and all columns are automatically INCLUDED in the Index. 5. Total there can be MAX 8 Non Clustered Indexes created on an In-Memory table. 1. Hash Indexes: are used for Point Lookups or Seeks. Are optimized for index seeks on equality predicates and also support full index scans. Thus these will only perform better when the predicate clause contains only equality predicate (=). 2. Range Indexes: are used for Range Scans and Ordered Scans. Are optimized for index scans on inequality predicates, such as greater than or less than, as well as sort order. Thus these will only preform better when the predicate clause contains only inequality predicates (>, <, =, BETWEEN). You will see in the Execution Plan image below that Equality Operator with Hash Index Costs you only 4%, but Range Index Costs you 96%. You will see in the Execution Plan image below that Inequality Operator with Range Index Costs you only 1%, but Hash Index Costs you 99%. So, while designing In-Memory Tables and Memory Optimized Indexes you will need to see in future that how you will be going to query that table. It also depends upon various scenarios and conditions, so always keep note of these things in advance while designing your In-Memory Tables. Incorrect syntax near the keyword ‘ON’.